Here’s a cute little story that proves once again that sometimes in sports you’ll see something you’ve never seen before – indeed, perhaps that no one has seen before. The unlikely location for the historic moment in question was Airport Lanes in Cheektowaga. It was on Saturday afternoon of Labor Day weekend. Eight members of the Western New York chapter of Mensa had gathered for their annual bowling outing. Most of the group could be called “occasional” bowlers – maybe once a year, maybe a little more often. The first two games were rather typical, with the scores ranging from 51 to 186. Five members of the group quit after two games, but three more continued for a third game. The focal point of the story now becomes Joe – who had bowled about three previous times in his life, all of them in the distant past. Joe was the one who rolled the 51, but was starting to show a little more consistency in Game Three. Joe threw a ball down the lane that headed for the right corner. 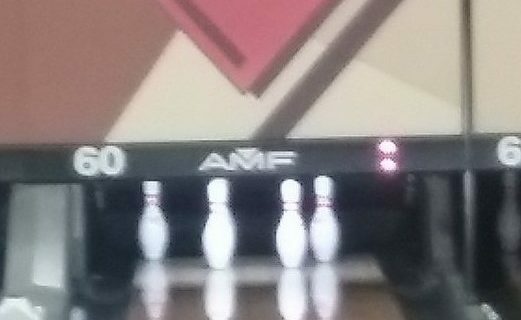 Just as it fell into the gutter, it nicked the 10-pin. That should have been the end of the story, except that pins kept falling down – one by one, almost in slow motion. When the situation finally became stable, Joe had left the 2-3-6-7-8 combination standing. I let out with a “Wait a minute” and stared in disbelief at the combination of upright pins. How could that happen? Surely, no one had ever knocked down just those particular pins. I quickly got my phone, walked to the foul line, and took a photograph of the pins for posterity. Even the computer “sparemaster” that displays the method for making a spare on the screen above the lane didn’t have this particular combination in its system – and I assume it must have a couple of hundred such tips in its memory. I would guess that the 10 took out the 9, which hit the 5, which took care of the 1, while the 9 finished off the 4. But I’m not sure. Joe was a little surprised about the fuss, but soon went back to bowling. It would be an even better story if he made the spare, but he couldn’t convert it. Well, it’s not a shot you can practice. I suspect we’ll back at Airport Lanes next year for the 2018 bowling outing. I wonder if there will be a plaque on display marking the 2-3-6-7-8 leave when we get there. Visit here to read more of Budd’s sometimes unusual, but always entertaining takes on sports in WNY.